We know that there have done lots of conversation about Blogspot and WordPress. Lots of people who don't like blogspot they do like WordPress. The most of the reason was all about SEO difficulties. But now time have changed and also blogger have changed their difficulties. So I want to say who ever working on blogspot and now new person also want to work here as a blogger. You can start and keep going on. There have lots of easy and known way to do better SEO in blogspot. Here you can start your free blog or even you can buy and add domain in this platform. There have lots of site they sell Blogger template. Also there available massive amount of free template for you. Today I will tell you about some important SEO tips and techniques. If you want to run a good blog to be successful online then you should follow lots of thing that we don't know even its tough to maintain. So I think if you get a guild line then that will be helpful for newbie and old blogger who really want to do something with their blog. When we are talking about Blogspot vs WordPress then we always give the priority to WordPress for having the good SEO facilities. But now you should know that google have included lots of SEO features in blogspot that will help you to do better Search Engine Optimization now than the previous time. This is the blog platform of google. So you will get some extra good SEO result than the others if you do everything well. We know that there have two kind of SEO: OFF Page SEO and ON Page SEO. Today my SEO tips all about ON Page SEO. This is the first and important thing you should do follow at least decently. Bellow my guild will help you to learn basic and you can make your blog SEO friendly to Search Engine. In Blogspot SEO the format of post title plays a great role. Usually we see post title followed by the home page title. To understand have a look on bellow image. Here post title should not be exist. The good one will be shown without Home Page title. The perfect looking is shown to the bellow image. This thing harmful for SEO friendliness of the Title of Article. Now you should follow the bellow instructions to remove it. I have added the code bellow to fix it. After doing this your every post URL will only show the page title. This is most important thing that you must follow. Permalink is another key foreword that helps to get rank of post in search engine. Few simple things you should follow while giving a permalink. Make it short and keep the number of letters within 50. All letters should be small letter. You should stop using few single letters and words as like: a, an, the, etc. While writing an Article for post, you will get an option to edit the post permalink. You can use it to edit and giving the right SEO friendly permalink. Better thing is that you can just set the main keyword of the Article in your permalink. Normally it will set as Automatic permalink but you can edit it from the permalink option by clicking on Custom Permalink. For better understand see bellow image. In Blogspot image is a also good thing for getting it on search result. You should add alt text and title text in the image properties. You may think what title or alt text you will put there. Just use your post title and the keyword on image. 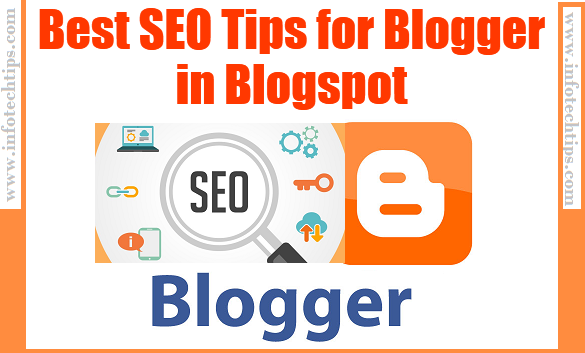 As like if Title is "Best SEO Tips for Blogger" then in image properties title text can be the "Best SEO Tips for Blogger" and alt text can be "Best SEO Tips". This helps the search engine to know about the image. You can also give those text as depending on image what is all about image showing and meaning. It helps a lot to be SEO friendly for search engine. Level is also an important thing. Set level in your blog post category wisely and remember always use small letters for level keywords. Why set level, I wanna explain. If you post Mozilla Firefox, Google Chrome and more software as like Km-player, Vlc Player. Then what you have to do that set Google chrome and Mozilla Firefox in "browser" level. And Km-player and Vlc player in "video player" level. This will help you to search engine understand better to indexing and also user will be able to find his desire software by clicking on specific level. Level helps to show the related post widget in the blogger. Meta tag is a tag which helps search engine to identify a website, description and other details by using HTML tags. You should add a Nice title for your site. 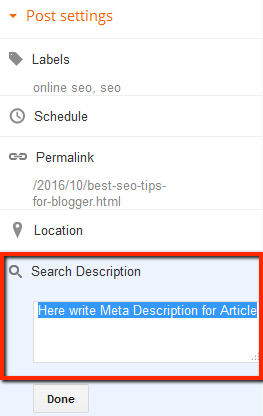 For the site in meta description tag you have to write a good description with main keywords about that you will write in your web. If you do like to targeting keywords then include those keywords in the description. And make sure that you put those keywords in Meta Keyword tags. Most of the time we see lots of people using same keywords too much time in the Article. I would like to say don't do it. One keyword 2 or 3 time is enough for a good article. Too much use of keyword harmful for your post. Post title also important to keep keyword in it. You should use targeting keyword properly in the post title and article. Don't use the same keyword more than three times. I do follow this that's why 3 time is my limit. Keep those targeted keywords on the above of article for better. Nofollow is a HTML attribute which use in hyperlinks to help to know the search engine that listed link in your website, you don't follow. 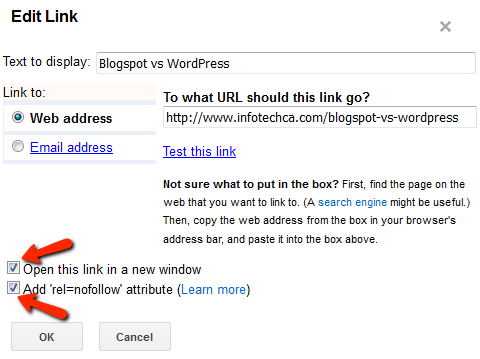 In blogger when you are adding other web link then you should select "Open this link in a new window" and "Add 'rel=nofollow' attribute. This helps the search engines to prevent URL from crawling particular link. 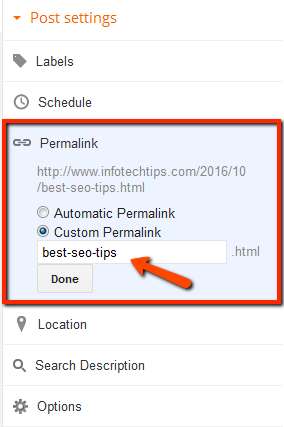 This if one of small SEO trick that we should follow. Meta Description for post which is very important part for SEO. Without it most of the time good content gets bad rank on Search Engine. While you are posting a new article you should write a good meta description for article. Make sure all keywords you are targeting that is included in the description wisely. This helps to get first rank by following matching keywords when someone searching those keywords on Search engine. I see that many blogger don't follow internal linking. This is really important to do linking of your internal pages to another page wisely. Internal links helps you to generate more visitors and that also helps to get good ranking on Search Engines. The method I say optimization of internal links. Custom Robot Header Tags is very important for a site. But don't do it with your own mind. There have difficulties to do it properly. Today I am giving you the perfect one that most of professional blogger follows and also me. How to use it lets see bellow image and instructions. First go to blogger Settings> Search Preference. 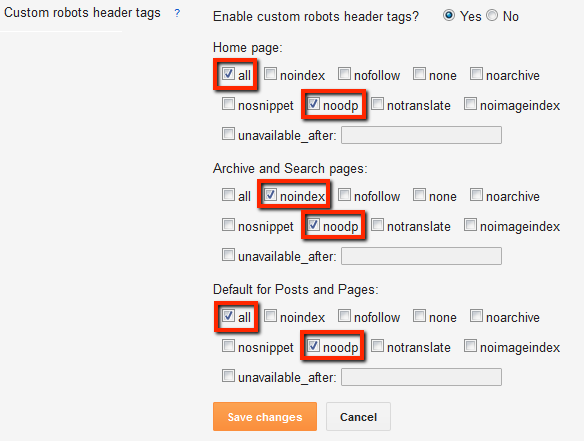 Now you will see Custom robots header tags option here click on Edit to change. Now follow the image bellow and select all red indicated options from your setting then click Save Changes. All those tips and tricks I have described is really most important for getting good rank on search engine. This will help you make quality blog which is SEO friendly. For Newbies this is the first important thing that you must have to follow. Otherwise you will be tired of blogging. Although, there have lots of SEO steps which is in advance level. But you can improve your blogging just by posting quality article and share it on socials networks. I think my article will be helpful when you are done following all instructions primarily. One more thing is that in blogging platform there is going on a big contest. So at present if you are Newbie then you have to be patient for getting good result. Thanks for give me your time. And don't forget to share this article with your friends because it can be helpful for them also. You can tell me about your problem and opinion by commenting bellow. Very nice information for SEO service.Thanks share. Hello admin, thanks for the tip. I will bookmark this and apply it on my blog. Cheers! Properly explained. Good blog. Explained well. Great blog for those who are looking for SEO. keep writing such content. Yes I'm agree with u that WordPress giving more facilities for SEO than Blogspot. I am also use Wordpress and Blogspot. I have a Site where I using Woedpress. Buy Directories Submission - Great Article thanks for sharing this blog with us. I have read your blog its very attractive and impressive. Great blog for those who are looking for SEO. keep writing such content. Very nice information for SEO service.Thanks share.Bluetech are the best organic Affordable SEO Service Packages provider at the affordable price. Our SEO experts deliver you guaranteed SEO results.